The StorkCraft Verona 4 in 1 Convertible Crib will instantly transform your baby space from bleak to chic. 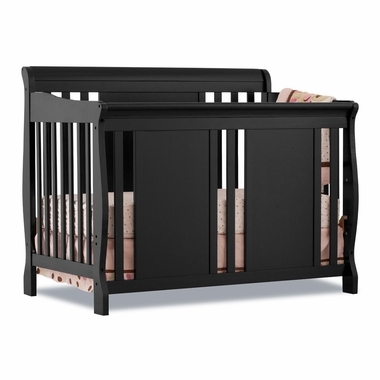 The modern design with curving top rails and unique, front panel makes this crib quite a looker while the elegant, Black finish adds beauty as well as safety because it's non-toxic. The crib's rails are all static and can't move and the mattress support is adjustable and can be lowered as your child grows, ensuring your active child is safe from falls. This well built crib is made of solid wood to withstand years of use and to be durable enough to convert to a toddler bed, daybed and full size bed in the future. (full size head/footboard included) Give your baby the dream nursery he/she deserves by pairing this crib with other StorkCraft furniture such as; changing table, dresser, chest and glider.